This beautiful treasure is entirely hand crafted in pure 18kt yellow solid gold. 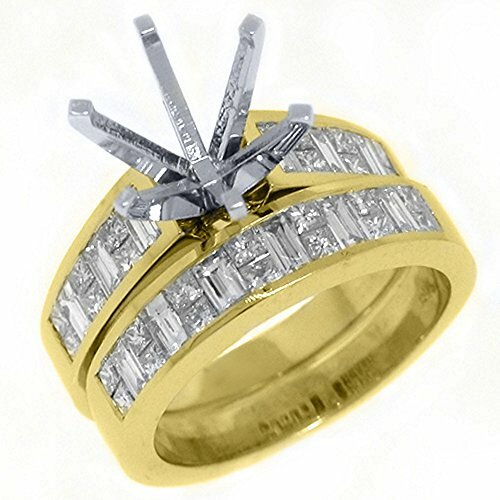 The engagement ring is invisible set with 12 princess cut diamonds and 6 baguette cut diamonds. A custom made wedding band completes the design and contains an additional 14 invisible set princess cut diamonds and 6 baguette cut diamonds that line up with the engagement ring and complement it perfectly. The entire set weighs 1.88 Carats. The stones are a blinding white G-H color and piercing VS2 clarity. 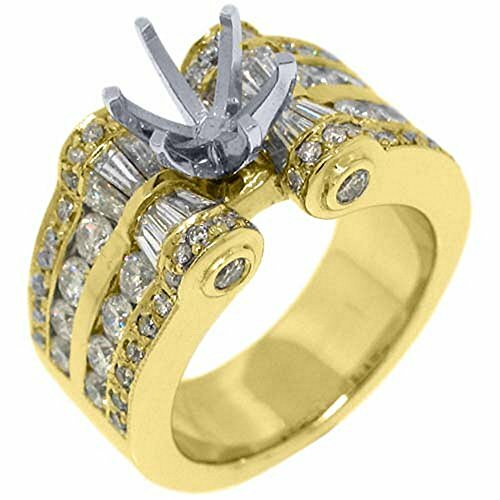 This is a perfect engagement ring and wedding band set. 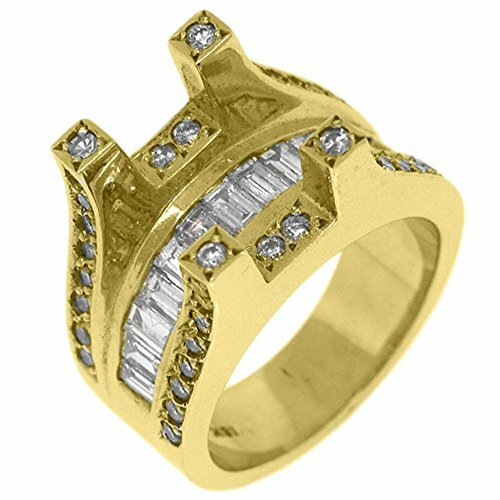 This beautiful treasure is entirely hand crafted in pure 14kt yellow solid gold. 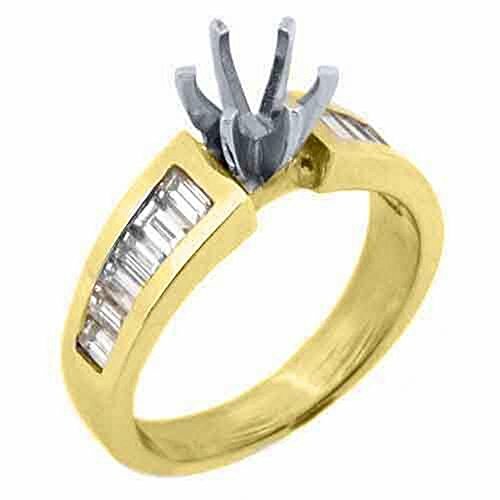 The engagement ring is laced with channel set baguette cut diamonds weighing .25 Carats. A custom made wedding band completes the design and contains an additional .75 Carats of channel set baguette cut diamonds that line up with the engagement ring and complement it perfectly. The stones are a blinding white H-I color and piercing SI2-3 clarity. 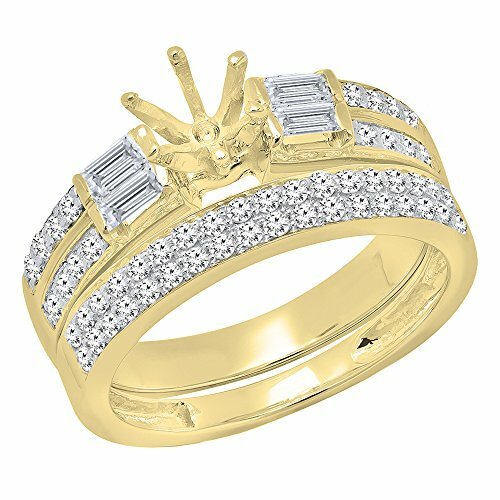 This is a perfect engagement ring semi-mount and wedding band set. This beautiful treasure is entirely hand crafted in pure 18kt yellow solid gold. The ring is channel set with 13 baguette cut diamonds and pave set with 40 brilliant round diamonds weighing approximately 2.21 Carats. The stones are a blinding white H-I color and piercing SI1-2 clarity. The tension setting on this semi-mount will accommodate a princess, round, pear, heart, oval, emerald, marquise, asscher or radiant shape stone from 1.00 Carat and up. This semi-mount ring is perfect for an engagement or wedding ring. This beautiful treasure is entirely hand crafted in pure 18kt yellow solid gold. 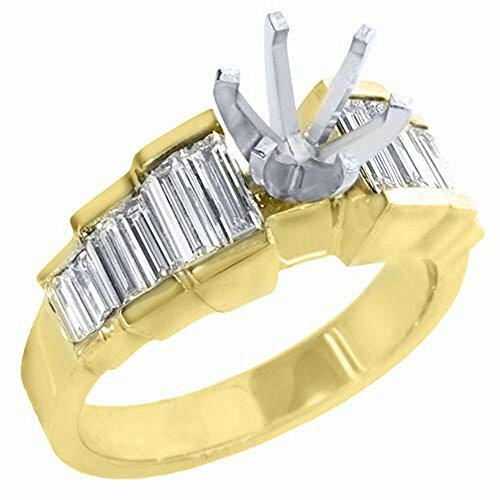 The ring is channel set with 16 baguette cut diamonds, 16 brilliant round diamonds, bezel set with 4 brilliant round diamonds, and pave set with brilliant round diamonds weighing approximately 2.78 Carats. The stones are a blinding white H-I color and piercing SI1-2 clarity. The tension setting on this semi-mount will accommodate a princess, round, pear, heart, oval, emerald, marquise, asscher or radiant shape stone from 1.00 Carat and up. This semi-mount ring is perfect for an engagement or wedding ring. 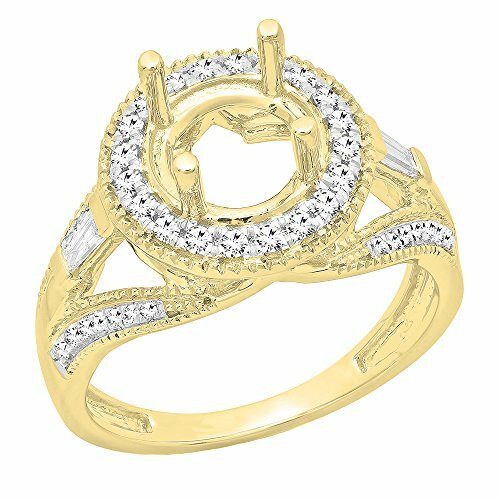 This beautiful treasure is entirely hand crafted in pure 14kt yellow solid gold. 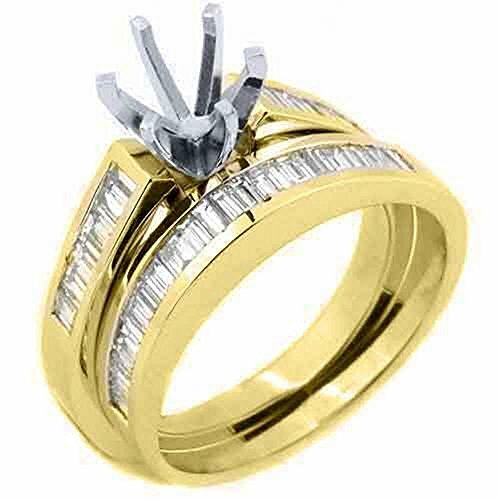 The ring is wreathed with 12 channel set baguette cut diamonds weighing approximately 1.00 Carat. The stones are a blinding white H-I color and piercing SI1 clarity. This semi-mount ring is perfect for an engagement or wedding ring. This beautiful treasure is entirely hand crafted in pure 14kt white solid gold. The ring is wreathed with 12 baguette cut diamonds weighing approximately 1.00 Carat. The stones are a blinding white H-I color and piercing SI2 clarity. 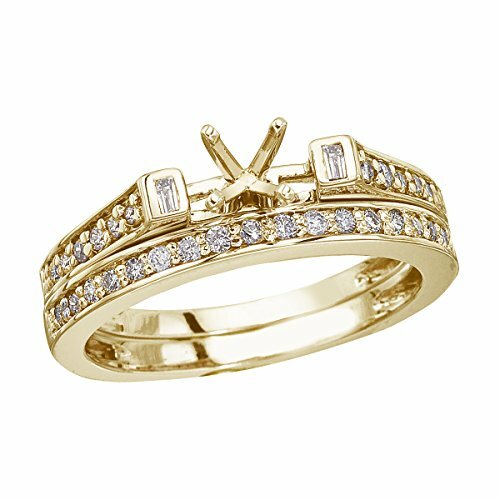 This semi-mount ring is perfect for an engagement or wedding ring.